Britannia emerged when kingdoms of Scotland and England were merged to create a ‘United Kingdom’ in the 18th century. She was visualised wearing a Greek helmet and shield, indicative of Greek influence symbolising rationality. She rode a lion indicating her imperial nature. The word imperial was not bad then, as it is today. Later, she was shown holding the trident of the sea-god Poseidon displaying the power of the British navy that controlled the seas and created the empire where the sun never set. The image was a reminder of the great queens of England: Elizabeth I and of course, Queen Victoria. Imitating Britannia, New Zealand embodied itself in Zealandia, though she did not become the rage. And, in Sweden, there rose Mother Svea, embodiment of the patriotic spirit of the Swedish people, inspired by the image of Viking Valkyries, the shield maiden of the gods and noble warriors. Kathleen Ni Houlihan, or Kathleen of the House of Houlihan, inspired Irish nationalists. They spoke of her as an old woman who had lost her home, who turned young when she inspired young men to fight, and even die, for her, like noble knights. Later, when many Irish people migrated to America, she embodied the homeland remembered nostalgically. In France, Marianne embodies the Republic and the ideals of reason. A woman was chosen to counter the monarchy represented by male figures. She was visualised wearing a Phrygian cap — soft and conical with the tip pointing forward – that came to represent liberty. This is because in Roman times, this cap is what the freemen wore and this is what was given to slaves when their masters set them free. In the 18th century, it was illegal to publish debates that went on in the British Parliament. And so political magazines published those using fictitious names for people and places. In these reports, colonies in America came to be known as Columbia. Later, with a Phrygian cap and draped in American flag, she became the symbol of a republic, who invited young people to fight for her. The idea of homeland mother goddesses probably originated with the concept of Roma, embodiment of the Roman Empire, who was seen as laurel wreath wearing mother by the Romans, a w***e by Christian martyrs, and a saint in the Holy Roman Empire. 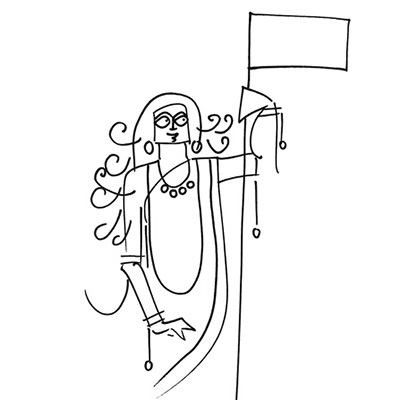 The idea of Bharat Mata emerged during India’s freedom struggle from the 19th century play of Kiran Chandra Banerjee, novel of Bankim Chandra Chattopadhyaya who also coined the hymn Vande Mataram (salutations to the mother), essays of Bipin Chandra Pal, and the painting of Abanindranath Tagore, where she is depicted wearing saffron, and holding in her four hands beads (faith), Vedas (knowledge), rice stalks (food) and fabric (clothing) for her children. Later, she was visualised riding a lion, or a chariot pulled by lions, with the tricolour flag in her hands, presented as Sita who is abducted by the British-Ravana or Draupadi abused by the British-Kichaka, or Kali, unclothed and naked, because of the greed of Britannia, and even Durga ready to lead ‘noble patriot children’ in war against ‘anti-national scum’. Thus is nationalist mythology constructed by boys, for boys, who want to impress their Ma.